Facebook both perfected and ruined the birthday. At first, it was the greatest convenience—never forget a special day ever again! And then it stopped having any meaning. On Facebook, your birthday is automated and empty because nobody has to devote a single shred of mental energy to remembering or celebrating it. Here's how to bring back the love. Your birthday used to be an event—now it's a notification. Thanks to Zuck & Co, nobody has to make any effort to remember it. Facebook became too helpful, and in the process, completely cheapened the occurrence it was trying to make easy. When the clock hits midnight on the anniversary of your womb escape, people you haven't seen or spoken to in years, maybe, trickle in to leave a perfunctory "happy birthday!" Maybe you won't even get an exclamation point. They're only doing it because Facebook stuck the event in their face like any other after-work drink, house party, or going-away party. It takes fewer than ten seconds to type out a salutation and hit enter. This is the modern birthday. And it's not just you—everyone does it. Almost every day. Why? Because it's just so easy; it makes us feel like we're good people. Facebook now not only automatically alerts you when it's a friend's birthday, but lets you click that alert to post directly on their wall. You don't even have to visit their profile to remember how you know them or what they look like. The next logical step is having Facebook just post "happy birthday, buddy!" on your behalf at 12:01 AM every year. The intimacy is gone. The thoughtfulness is gone. And that's sad. It doesn't have to be this way. If you actually care about someone enough to wish them a real, non-Facebook prompted happy birthday, you need to cheat. You need to wish them an early happy birthday. Yep. It's the only way you can prove you actually remembered someone's birthday in the year 2012. Write on their wall the night before-hell, even days before! Go nuts!—wishing them a great birthday in the future tense. Example: Have a great birthday tomorrow! 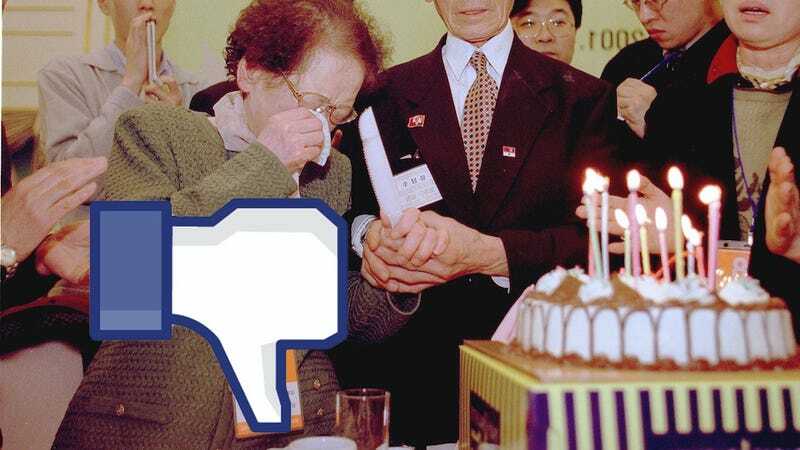 This might shock you to the point of actual death, but you can express warm birthday feelings outside of Facebook. Send an email, send a text, start a video call. Even if you cheated and noticed the birthday via Facebook, sending out an independent hurrah will equally shock the recipient. You'll be noticed outside of the low droning on the Timeline. You'll seem like a pal. You'll be the person who actually knew without it being beamed directly into your brain and your fingers moved by little strings hoisted by Zuckerberg's delicate golden fingers. You remembered. You cared. You're a good friend. You did it. Congratulations: You just made the world a better place. No, seriously. You actually did. User Manual is Gizmodo's guide to etiquette. It appears as if by magic every Friday.